Staithes is a seaside village in the Scarborough Borough of North Yorkshire, England. Easington and Roxby Becks, two brooks that run into Staithes Beck, form the border between the Borough of Scarborough and Redcar and Cleveland. Formerly one of the many fishing centres in England, Staithes is now largely a tourist destination within the North York Moors National Park. The name Staithes derives from Old English and means 'Landing-Place'. It has been suggested that it is so named after being the port for the nearby Seaton Hall and Hinderwell. At the turn of the 20th century, there were 80 full-time fishing boats putting out from Staithes. A hundred years later there are still a few part-time fisher men. There is a long tradition of using the coble (a traditional fishing vessel) in Staithes. It was reported in 1997 that the Royal Mail were encouraging the occupants of Staithes to number their houses instead of relying on names. Whilst the regular postperson had no difficulty with the narrow streets and cottages, the relief postal staff were getting confused. Royal Mail also claimed it would aid efficiency by their postal machines which automatically read the addresses. Staithes has a sheltered harbour, bounded by high cliffs and two long breakwaters. A mile to the west is Boulby Cliff where, for a brief period, alum, a mineral used to improve the strength and permanency of colour when dying cloth, was mined. The mining operation ended when a cheaper chemical method was developed. The ruined remnants of the mines can be seen from the cliff top when walking the Cleveland Way between Staithes and Skinningrove. Staithes is a destination for geologists researching the Jurassic (Lias), strata in the cliffs surrounding the village. In the early 1990s, a rare fossil of a seagoing dinosaur was discovered after a rockfall between Staithes and Port Mulgrave to the south. This fossil has been the focus of an ongoing project to remove the ancient bones of the creature. Port Mulgrave remains one of the best places on the northern coast to find fossils of ammonites and many visitors spend hours cracking open the shaly rocks on the shoreline in the hope of finding a perfect specimen. The permanent population of the village has dwindled due to more than half of the houses being second homes owned by outsiders from cities such as Leeds and York and further afield. Even though fewer than half of the houses in the village are occupied by local people, the traditions of the village have not yet died; many of the local women still buy Staithes bonnets from the sole bonnet maker, and the Staithes Fisher Men's Choir is still going strong. There is active local participation in the local RNLI Lifeboat station and crew. Locally, the name was traditionally pronounced "Steers". The CBeebies series Old Jack's Boat, starring Bernard Cribbins, is set in and filmed in Staithes, with Old Jack's house located at 4 Cowbar Bank in the town. The 2017 film Phantom Thread starring Daniel Day-Lewis features the cobbled streets of Staithes. There is a local pub crawl known as the "Roxby Run". This starts at the "Fox and Hounds" in the nearby village of Dalehouse then goes to Staithes Athletic Club, the "Captain Cook Inn", the "Black Lion" (now closed) the "Royal George" before finishing at the "Cod and Lobster" on the harbour. The village was home to a group of twenty to thirty artists known as the "Staithes group" or the "Northern Impressionists". The group contained renowned artists such as Edward E. Anderson, Joseph R. Bagshawe, Thomas Barrett and James W. Booth and was inspired by other impressionists such as Monet, Cézanne and Renoir. Dame Laura Knight became the most famous member of the Staithes Group; she and her husband and fellow painter Harold Knight kept a studio in the village. To celebrate this history, Staithes held a festival of arts and heritage in 2012. Many houses and other properties opened their doors to the public as pop-up galleries, creating a trail through the village. In addition, events celebrating the heritage of Staithes were held. Such was the success and interest in the festival, the villagers intend to make this an annual event. In 1745–46, Staithes's most famous resident, James Cook (born in Marton-in-Cleveland, Middlesbrough), worked in Staithes as a grocer's apprentice where he first gained his passion for the sea. He moved to nearby Whitby where he joined the Royal Navy. William Sanderson's shop, where Cook worked, was destroyed by the sea, but parts were recovered and incorporated into "Captain Cook's Cottage". This has been the residency of a local Staithes family for several generations. Between 1883 and 1958, the village was served by Staithes railway station which was on the Whitby, Redcar and Middlesbrough Union Railway. The southern end of the village is bisected by the A174 road between Thornaby-on-Tees and Whitby. ^ "OL27" (Map). North York Moors. 1:25,000. Explorer. Ordnance Survey. 2016. ISBN 9780319242667. ^ Ekwall, Eilert (1960). The concise Oxford dictionary of English place-names (4 ed.). Oxford: Clarendon Press. p. 436. ISBN 0-19-869103-3. ^ "Staithes conservation area appraisal" (PDF). northyorkmoors.org.uk. North York Moors National Park Authority. January 2001. p. 3. Retrieved 3 April 2017. ^ "Ports.org.uk / Staithes". www.ports.org.uk. Retrieved 31 March 2017. ^ a b "From Captain Cook to CBeebies at the seaside". Yorkshire Evening Post. 6 March 2017. Retrieved 3 April 2017. ^ Burnham, Nigel (24 March 1997). "Number's up for Captain Cook's village". The Independent. Retrieved 3 April 2017. ^ "Better moorings for Staithes harbour". Whitby Gazette. 16 August 2016. Retrieved 2 April 2017. ^ Historic England. "Boulby Alum Quarries and works (1018336)". National Heritage List for England. Retrieved 2 April 2017. ^ Dillon, Paddy (2010). The Cleveland Way and the Yorkshire Wolds Way with the Tabular Hills walk. Cumbria: Cicerone Press. pp. 144–147. ISBN 1849654123. ^ a b "Picture Post: Wave of visitors for Staithes, courtesy of children's TV show". The Yorkshire Post. 3 February 2014. Retrieved 31 March 2017. ^ Appleby, John (11 August 2014). "Hanging by a thread: Whitby's jet and fossil hunters". The Guardian. ^ Jeffels, David (30 June 2010). "Keeping the fishing bonnets tradition alive in Staithes". Gazette & Herald. Retrieved 2 April 2017. ^ Robson, Dave (9 August 2018). "Staithes Lifeboat Weekend to go ahead despite rock fall tragedy". Gazette Live. Retrieved 9 March 2019. ^ "Staithes showcased in children's TV programme Old Jack's Boat". Whitby Gazette. 23 January 2013. Retrieved 31 March 2017. ^ "Staithes". www.yorkshireguides.com. Retrieved 31 March 2017. ^ "TV and Film Locations". North York Moors National Park. Retrieved 2 February 2018. ^ "Staithes - The North Yorkshire Gallery". The North Yorkshire Gallery. Retrieved 3 April 2017. ^ "Eminent Staithes Group artwork hidden away for a century". Whitby Gazette. 11 September 2012. Retrieved 3 April 2017. - "Hidden talents". The Northern Echo. 15 February 2010. Retrieved 3 April 2017. ^ "Forgotten work by Staithes Group artist goes under the hammer". Yorkshire Post. 14 February 2016. Retrieved 3 April 2017. ^ "Staithes Festival". Staithes Festival of Art and Heritage. Retrieved 31 March 2017. ^ Beaglehole, J.C. (1992). "1: The North Sea". The life of Captain James Cook (9 ed.). California. : Standord Univ. Press. p. 5. ISBN 0-8047-2009-6. - "Captain James Cook's early life at Staithes". www.staithes-town.info. Retrieved 3 April 2017. ^ a b England (6 ed.). London: Rough Guides. 2004. p. 1031. ISBN 1-84353-249-2. ^ "James Cook in the North East - Staithes and Whitby". www.captcook-ne.co.uk. Retrieved 3 April 2017. ^ "Disused Stations: Staithes Station". www.disused-stations.org.uk. Retrieved 3 April 2017. Whitby is a seaside town, port and civil parish in the Scarborough borough of North Yorkshire, England. Situated on the east coast of Yorkshire at the mouth of the River Esk, Whitby has a maritime, mineral and tourist heritage. Its East Cliff is home to the ruins of Whitby Abbey, where Cædmon, the earliest recognised English poet, lived. The fishing port emerged during the Middle Ages, supporting important herring and whaling fleets, and was where Captain Cook learned seamanship. Tourism started in Whitby during the Georgian period and developed with the arrival of the railway in 1839. Its attraction as a tourist destination is enhanced by the proximity of the high ground of the North York Moors national park and the heritage coastline and by association with the horror novel Dracula. Jet and alum were mined locally, and Whitby Jet, which was mined by the Romans and Victorians, became fashionable during the 19th century. The River Esk is a river in North Yorkshire, England that empties into the North Sea at Whitby after a course of around 28 miles (45 km) through the valley of Eskdale, named after the river itself. The Esk is the only east flowing major river in Yorkshire that flows directly into the North Sea; all other watercourses defined as being major rivers by the Environment Agency, either flow to the North Sea via the River Tees or the Humber Estuary. 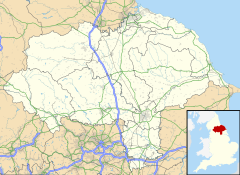 Loftus is a town and civil parish in North Yorkshire, England. The local council, a unitary authority, is Redcar and Cleveland. It lies in a region between Saltburn-by-the-Sea and the North York Moors. It was formerly known as Lofthouse. The population of the Loftus ward of the Redcar and Cleveland unitary authority taken at the 2011 census was 6,382. Great Ayton is a village and civil parish in the Hambleton district of North Yorkshire, England, on the edge of the North York Moors. It lies 7 miles (11.3 km) southeast of Middlesbrough and 3 miles (4.8 km) northeast of Stokesley on the border with the unitary authorities of Redcar and Cleveland and Middlesbrough. According to the 2011 Census, it has a population of 4,629. Borrowby is a village and civil parish in the Scarborough district of North Yorkshire, England. The village is situated in the North York Moors National Park, inland but near the coast, between Whitby and Saltburn-by-the-Sea. The population of the civil parish was estimated at 50 in 2014. According to the 2001 UK census, Borrowby parish had a population of 56. Boulby is a village in the borough of Redcar and Cleveland and the ceremonial county of North Yorkshire, England, located within the North York Moors National Park. Boulby was in the North Riding of Yorkshire until 1964, followed by the county of Cleveland until 1996. It is located just off the A174 near Easington, and 1-mile (1.6 km) west of Staithes. The village was the site of alum mining activity in years past, and is currently the site of Boulby mine, a 200-hectare (490-acre) site run by Cleveland Potash Limited which produces half of the UK's output of potash. Easington is a village in the unitary authority of Redcar and Cleveland and the ceremonial county of North Yorkshire, England. North Skelton is a village in the unitary authority of Redcar and Cleveland and the ceremonial county of North Yorkshire, England. Boulby Quarries is a 40.3 hectare geological Site of Special Scientific Interest in Cleveland, England notified in 1989. It is located close to the coast and the village of Boulby. The Scarborough & Whitby Railway was a railway line from Scarborough to Whitby in North Yorkshire, England. The line followed a difficult but scenic route along the North Yorkshire coast. Boulby Mine is a 200-hectare (490-acre) site located just south-east of the village of Boulby, on the north-east coast of the North York Moors in Redcar and Cleveland, England. It is run by Cleveland Potash Limited, which is now a subsidiary of Israel Chemicals Ltd.
Lockwood is a civil parish in the unitary authority of Redcar and Cleveland with ceremonial association with North Yorkshire, England. The population of Lockwood ward in the Redcar and Cleveland Unitary authority taken at the 2011 census was 2,022. Hinderwell is a village and civil parish in the Scarborough district of North Yorkshire, England which lies within the North York Moors National Park. Runswick Bay is a bay in the Scarborough Borough of North Yorkshire, England. It is also the name of a village located on the western edge of the bay. It is 5 miles (8 km) north of Whitby, and close to the villages of Ellerby and Hinderwell. It is a popular tourist attraction due to its picturesque cliffside village and Runswick Sands, a white sand beach. It is on the Cleveland Way hiking trail. Sandsend is a small fishing village, near to Whitby in the Scarborough district of North Yorkshire, England. It forms part of the civil parish of Lythe. It is the birthplace of fishing magnate George Pyman. Originally two villages, Sandsend and East Row, the united Sandsend has a pub and restaurant. A large part of the western side of the village, in The Valley, is still owned by Mulgrave Estate. The Valley is one of the most expensive areas to buy property on the Yorkshire Coast. The Church of St Oswald, Lythe, is the parish church for the village of Lythe, 4 miles (6.4 km) west, north west of Whitby in North Yorkshire, England. The church is at the top of Lythe Bank and is just east of the village on the A174 road.